The Equipment Specialist course is NOT a servicing course. 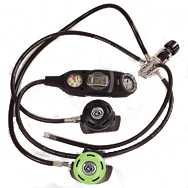 You will however learn how to manage basic scuba equipment adjustments such as blown o-ring, simple regulator problems or wet-suit tear to mention a few. Review the theory, principles and operation of scuba diving equipment. Learn about routine, recommended care and maintenance procedures, and equipment storage. How to overcome common problems with equipment and recommended professional maintenance procedures. Be certified as a PADI Scuba Diver or have a qualifying certification from another training organisation. No dives are required, so you can take the Equipment Specialist course any time of the year.